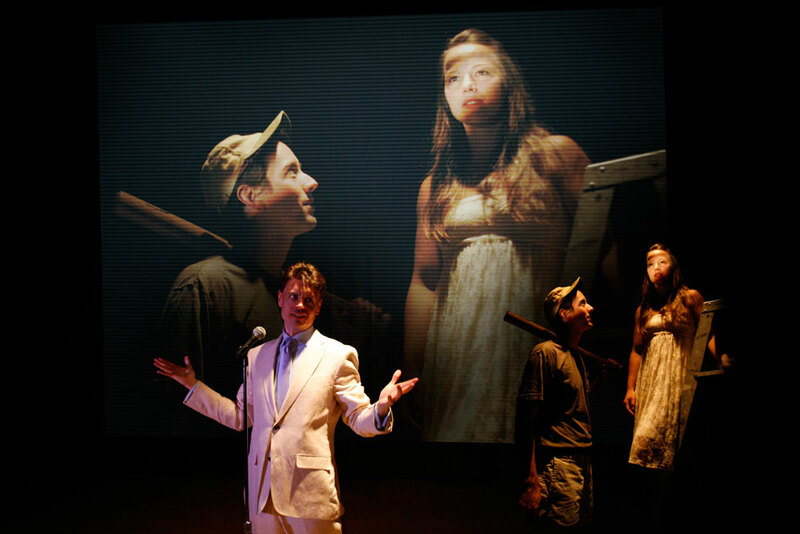 Our Town At The Headwaters, 2013. In this multimedia, multi-level flashback of psychedelic barbershop Americana, Liminal gave the American Dream a much-needed update. It was definitely not your father’s Our Town. Portland art-comedy darling Leo Daedalus (host of The Late Now) as The Stage Manager. And Introducing Jahnavi Caldwell-Green as Emily Webb, and Corey O’Hara as George Gibbs. Also featuring Jeff Marchant, Carla Grant, Alex Reagan, Leslie Finch, Rebecca Lowe, Wayne Haythorn, and Nathan Hansen, Jen Raynak (PCPA), Ben Purdy (defunkt, NWCT), and kollodi collaborate on sound, media, and visual design.